Adam Golaski's latest short story collection is Worse Than Myself. His translation of Sir Gawain & the Green Knight—"Green"—appears in installments on the critical site Open Letters. His poetry, fiction (horror and otherwise), and non-fiction has appeared in journals such as: word for/word, Supernatural Tales, McSweeney's, Sleepingfish, Conjunctions, and All Hallows. He is currently editing selected poetry of Paul Hannigan for Pressed Wafer, and co-edited for Flim Forum Press two anthologies of experimental poetry, Oh One Arrow (2007) and A Sing Economy (2008). 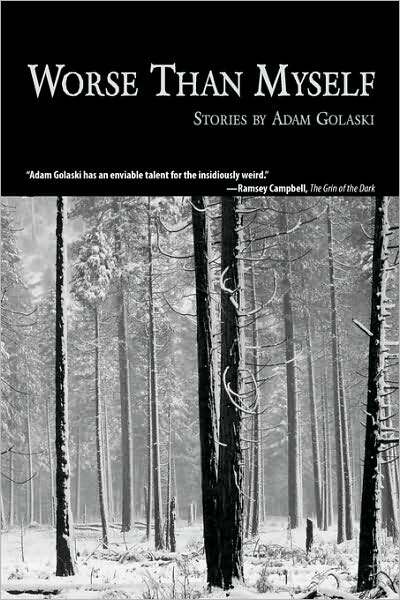 Adam edits and publishes New Genre, a journal of horror and science fiction, now in its seventh year. Hi! Thanks for agreeing to do the interview. First off, when did you know you wanted to become a writer/poet? Writing was a fear-filled school requirement, its mechanisms a totally mystery to me, until I was twelve. I wrote a short story and showed it to a classmate and he liked it and passed it along to other classmates who also liked it. I've identified myself as a writer ever since. What is it about horror that appeals to you? 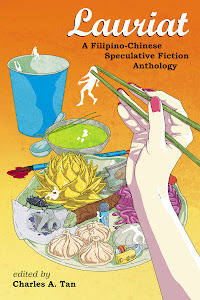 How about speculative fiction? In my household, horror and science fiction were presented to me with all other types of literature, with no caveats made about their worth. So I read in a very catholic manner, genre and non. What's the appeal of horror? Mystery. Mystery that isn't inevitably spoiled by a rational explanation. Conversely, the explanations in science fiction are as wondrous as the mysteries they undo. Both of these answers are so cute they can't possibly be good. In terms of fiction, what made you decide to write horror and speculative fiction? I was in my early twenties when I sat down to deliberately write a horror story and that story was “Back Home” (which is included in Worse Than Myself). I was already editing New Genre, and I was reading and rereading a lot of horror in order to teach myself about the genre--trying to understand what the parameters were, etc. I did write horror stories before then, but I didn't know it at the time. I just thought of them as stories. The same can be said for speculative fiction, though I've written very little (intentionally). A lot of your output has been short stories. What is it about the form that makes you suited to it? What are your experiences with novel-length fiction? I've written three novels. I'm revising the third now and have a fourth in the works. There's no form of writing that doesn't interest me, and I really mean that. I do love the short story--as a reader, especially--I prefer collections to novels as a rule. If the form does indeed suit me--and I take you question as a compliment, thank you--then it's because I usually start (prose) from a single strong image, and the story radiates from that. So, maybe (maybe!) single images are more likely to produce short work? What would you say was the biggest hurdle you had to overcome in order to break into the industry? I would say that I have yet to “break into the industry.” I may be on the cusp of a breakthrough, but then again maybe not. In terms of being published, the biggest hurdle was finding editors who like my work for what it is and not for what it might be molded into. I've been lucky to find more than a few. These editors ask smart and challenging questions, but they don't think the best way to edit is to Gordon Lish the hell out of everything. In your short story collection Worse Than Myself, a lot of the pieces have a gothic atmosphere to them. Was this a conscious decision? Atmosphere is very important to me. I reject (as editor of New Genre) solid horror stories that lack atmosphere, because without it they're only functional. When I wrote the stories collected in Worse Than Myself, I wasn't thinking Gothic, per se, but Gothic is such a part of the language of horror it's probably as apt a description as any. Could you tell us something more about your upcoming collection, Color Plates? Color Plates is a museum, alive in the now crystallized brain of a sort-of Mary Cassatt. Four rooms of Mary's museum are open to the public, and they are named Éduoard Manet, Edgar Degas, Henri de Toulouse-Lautrec, and Mary Cassatt. Each room exhibits little stories--plates--drawn from real paintings by the painters who are the rooms' namesakes. Though I'd not read these books when I began, Color Plates bears a passing resemblance to Baudelaire's Paris Spleen and to Italo Calvino's Cosmicomics. I've been told it's a bit like some of Gilbert Sorrentino's fictions. I think Rose Metal Press is publishing this on a dare. A lot of my writing is generated by systems I create. In this case, I developed a few rules, most of which I broke when I needed to. The rules are: 1. each story corresponds with a painting, 2. the stories are set in the present (not in the 19th century), 3. at some point, the characters in the story must arrange themselves into the scene the painting depicts (this was tricky for Déjeuner sur l'herbe! ), 4. there must be a character or narrator who is outside said scene--someone who takes the role the painter took, the roles of the observer, 5. none of the characters are to be named, 6. the stories are not to be (overtly) about painting, and, um, I think there are more rules but I can't remember. How did Raw Dog Screaming Press end up publishing your collection? Rose Metal Press for Color Plates? I handed Raw Dog a big sloppy mess of a ms., untitled, with unfinished stories and stories I'd later cut, coffee rings on the cover, pages stuck together with honey and God knows what else. Jennifer responded in an email, “Overall I think this is possibly one of the weirdest collections I've read. It's quite rare to read something that is actually disturbing in a really-not-sure-what-to-make-of-it kind of way”--and agreed to publish it, with the caveats that I would finish the unfinished stories and email the finished ms. so she could print a clean copy. Jeremy Lassen, who was booked solid and so never even read the ms., recommended I try Raw Dog. When I had a mostly complete draft I sent Color Plates to maybe half-a-dozen small presses I considered to be likely publishers and Rose Metal Press was one. Rose Metal Press specializes “in the publication of short short, flash, and micro-fiction; prose poetry; novels-in-verse or book-length linked narrative poems; and other literary works that move beyond the traditional genres of poetry, fiction, and essay to find new forms of expression”--all of which pretty much describes Color Plates. John Cotter, the editor of Open Letters (a journal to which I contribute), suggested I try them. And for that one good suggestion, I apparently have to keep buying him drinks, for, like, ever. How did you get involved with New Genre Magazine? Just out of college and with a tiny bit of saved money my then-roommate (Jeff Paris) and I decided to publish a magazine that would present horror and science fiction in a way that, up to that point, only non-genre fiction was being presented: in the form of a literary journal, with no traditional genre imagery whatsoever. The idea was to attract readers who were put off by the way the genres are typically presented, but who were smart enough to recognize good fiction when they read it, regardless of genre, while also appealing to genre readers by publishing real horror and real science fiction. This is tricky. That's what I did instead of backpacking through Europe. After the publication of issue number five, Jeff retired for a quiet life on the small island of Amity, where he is their chief of police. What do you look for in a horror story as editor of New Genre? I look for good language. I read lots and lots of submissions that are good, that will find homes in other magazines, but that forego interesting prose for the sake of plot. These stories bore me. Cliché--even little clichés, such as describing the sky as looking like a bruise, or comparing a road to an “endless ribbon”--will put me off a story (clichés are usually flags that the author isn't paying enough attention). After language I look for lasting images. What's one of the more challenging aspects working with New Genre? Most rewarding? I'll start with rewarding. The opportunity to publish really beautiful work unlikely to find a home any where else: Jaime Corbacho's “Honeymoon” (from #5), Jan Wildt's “Bink is Luv” (#4), Thomas Dunford's “Inside Everything is an Engine” and Cheryl Smith's “Two Birds” (#3). Matthew Pendleton's “I Am Antenna / Antennae” (#6). Back when the we first started New Genre, I used to telephone the authors whose stories I wanted to publish. One call stands out in my memory. I reached the author's wife and left the message with her--she was amazed. She asked, “So he's really a good writer?” That made me feel good. It's rewarding to work with Jeremy Withers, who designs our brilliant covers (since issue #4). He's a childhood friend; we used to make magazines together with notebook paper and staples. Now we're all grown up. What's challenging? Absolutely everything else. Selling copies! With regards to poetry, what aspect of it that tickles your fancy that fiction cannot satiate? I don't know that fiction couldn't be made to satiate what poetry does, but it doesn't, you're right. The latter strongly informs the former, and not the other way around, so that's important. When I write poetry the approach and the process is very different from fiction and very exciting to me. You've asked a big, complicated question! My poetry is as important to me as my fiction. What made you decide to start Flim Forum? Starting Flim Forum Press was Matthew Klane's idea, but we both consider the press to be an extension of what we're doing as poets. What are the challenges you face in the poetry scene? Have you thought of contributing to the speculative poetry scene, or do you find such distinctions/labels confining when it comes to poetry? Poems about fantastical beings are the foundation of all literature. I published a series of poems inspired by murderers (Laura Sims' brilliant “Murder Poems” in A Sing Economy). So I'm not ignorant to the fact that poems about the future, about monsters, etc., can be as good as poems about anything else. That said, I've never read any poetry that identifies itself as “speculative” or horror, or science fiction that was especially good. Perhaps the label causes the authors problems, and I assume the editors who publish these poems don't read enough poetry to know what good poetry looks like. Stop thinking of yourself as “aspiring.” By the phrase “aspiring writers” we usually mean writers who have yet to be published, but it's a mistake to confuse writing with publishing. There are published writers and unpublished writers. Being published hardly means being good. So, to unpublished authors, take yourselves seriously, use rejection as a motivation to do more work, and look for models worth imitating. Of course, if you're only thinking about writing, then you really only are aspiring, and I don't know what to suggest for you other than don't wait for inspiration, don't wait for the right moment, just get to work. Love your authors. Don't be the publisher notorious for the harsh “honesty” of your rejection letters (tact is not dishonest, kindness is not weakness). Don't act like a bouncer at an exclusive club. When you publish, you're part of a literary community, doing work for that community: be glad you're so lucky. And please, stop complaining about slush piles every damn chance you get. You sound like geezers moaning about their sore knees. Nope. Thank you for asking such good questions. I hope you'll have me over again sometime.